With two thousands years of history, calligraphy writing played an important role in the spread of learning, culture and religion. In the current world, calligraphy writing has become a form of art that carries expressive interpretation of words, phrases and stories. I am a typography design lecturer who has over 20 years of calligraphy writing experience. To me calligraphy writing is more than just a form of artistic expression, it is a good from of relaxation, where one needs to maintain his/her focus at all time in order to create beautiful letter forms. This process requires one to connect his/her mind, heart and hand movement. There are many different style of calligraphy writing, and the Foundational Hand is the most basic. 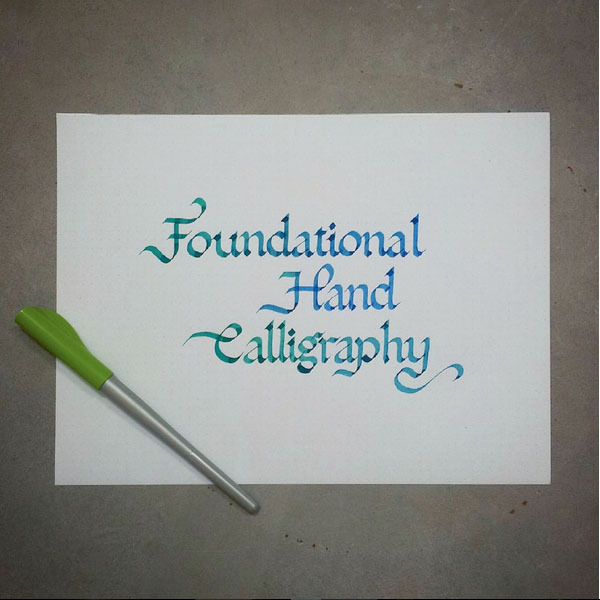 Learning Foundational Hand helps one to understand the flat nip calligraphy pen, the flow of inks, the writing logic of pen strokes in its most fundamental form, which make one pick-ups other calligraphy style more easier and faster. 1)	Understanding the flat nip pen (Pilot Parallel Pen). 2)	How to adjust your working space to suit your writing habit. 3) Calligraphy writing rules. 4)	Various practise strokes to get you started. 5)	Foundational Hand minuscules, majuscules, numbers and punctuations. 6)	Tips and writing practices. Location: Very Small Exhibition studio space, 100 Beach Road, Shaw Tower, #02-38. To sign up, join via this event page or whatsapp or SMS +65 9011 3220. Seats are limited. Please message the organiser if you have any questions.